Former F1 driver Robert Kubica says Jules Bianchi's Japanese Grand Prix crash serves as a reminder that the sport can never be made 100% safe. 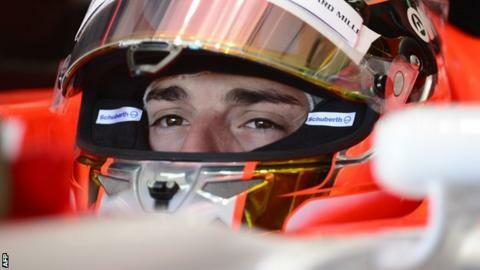 Bianchi lost control in wet conditions and collided with a recovery vehicle at Suzuka, suffering severe head injuries. Kubica, 29, who suffered a partially severed right hand in a rally accident in 2011, told BBC Sport: "When you see it, you ask how is this possible? "But unfortunately, it can happen. There is always risk in motorsport." Kubica pointed to the 2007 rain-hit European Grand Prix at the Nurburgring as an example of how Formula 1 can be about fine margins. "I know him quite well, he's a really nice guy and his talent is high, but it doesn't matter how much talent he has or if he is a friend or not - the danger remains." Tonio Liuzzi lost control of his Toro Rosso on the run down to the first corner, spinning and almost hitting the safety car before lightly bumping into a tractor, which was en-route to rescue several other stricken cars who had gone off moments earlier. Liuzzi was unhurt. "He was OK and nobody noticed it might be dangerous," he said. "The FIA [world motorsport's governing body] has done an amazing job to improve things and it shows there are still things to improve. "But it also shows that there is always a danger - that's part of the sport. Even if you think it is safe, the danger is always there." Kubica was involved in a violent accident in 2007 when he crashed his BMW Sauber at 180mph in the Canadian Grand Prix, experiencing a deceleration force of 28G. The Pole hit a concrete wall in the middle of the hairpin before rolling back across the track into the barriers on the other side. He escaped with light concussion and a sprained ankle and returned the following year to claim victory at the same track - his first and only F1 triumph. Kubica, who now competes in the World Rally Championship with M-Sport but has not recovered enough movement in his arm to return to F1, added: "We can forget how motorsport can be dangerous. "My case is not the same but I was quite unlucky and lucky - you can see it both ways. I wish Jules and his family all the best and I pray for him.